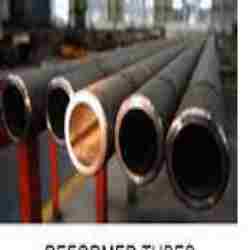 Offering you a complete choice of products which include reformers tubes, harp assemblies, catalyst tubes/reformer tube, tube supports, tube sheets and tube hangers. Catalyst reformer tubes are used to produce hydrogen from steam and natural gas. The hydrogen is subsequently converted to methanol, ammonia, town gas or is purified and used directly. 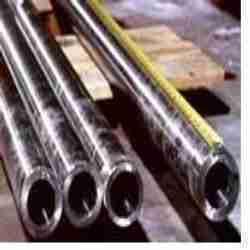 Alloy strength and creep strength is what we concentrate on with reformer tubes primarily in a HK, HP 50-50 CB alloy modified. Tubes assemblies for steam reformer and steam reformer, reformer/catalyst tubes, radiant coils, reformer harp coils, cracker tubes, ethylene cracking (pyrolysis) coils, hairpins, hangers, outlet collectors, inlet and outlet manifolds, tube stanchions, convection coils, pigtails, tube sheets, tube supports, transfer lines, furnace hooks, T-pieces ,Y-pieces, flanges, pump, valve and other static casting. 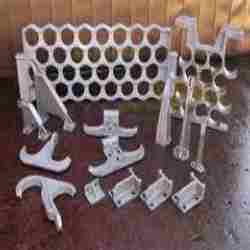 BMC can produce tube supports in all sizes, from smaller ones, like the supports shown here, to very large castings. All of our tube supports are capable of meeting very stringent NDT requirements. Some supports only require LPI on the surfaces, but others require radiography of critical areas to insure sound castings. This tube sheet is to be used in the convection section of a polypropylene furnace. The large flange across the bottom will be drilled with bolt holes and bolted to a structural member on the floor of the furnace then have tubes threaded through the holes and laid across the top of the support. 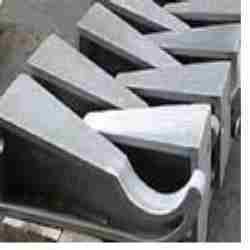 The tube sheet insures that the tubes will maintain even spacing in service allowing the heat from the furnace to circulate evenly around the tubes. The user will then have tubes threaded through the holes and laid across the top of the support. This tube sheet is made in HK-40 alloy. These hangers are bolted to the inside walls of a cracking furnace and are used to support tubes while in service. 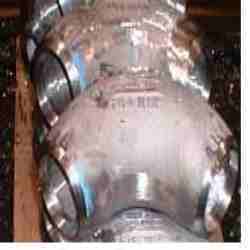 The hangers are to provide support for the tubes, which at high temperatures, have a tendency to sag or droop, causing premature failures in the tubes. 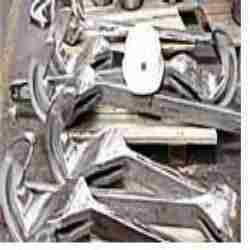 These hangers are cast in HK-40 alloy. 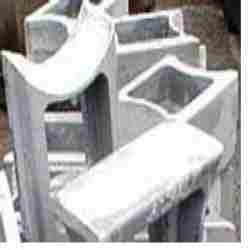 These statically cast blocks are used in a fashion similar to tube support sheets. 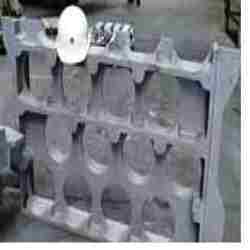 Cast in a variety of heat resistant alloys, spacer blocks are placed between tubes installed in a high temperature furnace to prevent the tubes from coming into contact with each other during use. 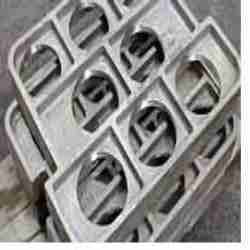 These hooks, cast in BMC are used in petrochemical furnaces to hold tubes, assemblies, etc. The long flange part of the hook is put through a hole in the top of the furnace and pinned in place. The hook portion is suspended in the furnace and can be used to support a variety of components. Looking for Petrochemical Industry & Fertilizer Industry ?